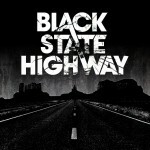 Share the post "Album review: BLACK STATE HIGHWAY – Black State Highway"
‘Black State Highway’ is a self titled 8 track debut album by a young Brighton band of retro rockers who provide their own contemporary take on classic hard rock. They may unashamedly tip their hat to hard rock heroes such as AC/DC, Sabbath, Purple and inevitably Zeppelin but they ultimately rely on their own songs and some powerhouse rocking to unveil a melodic hard rock style best evidenced by the third track ‘Broken’. ‘Broken’ is also the track on which Latvian vocalist Liva Steinberga really hits her range, as she extends her phrasing to fulfil the promise shown on the opening track ‘Conclusion’. It’s a Zeppelin influenced piece built on a familiar quiet-to-loud dynamic, full of booming riffs and an up-in-the-mix drums. The band mines Sabbath riffs on the following track ‘Free’, as Lisa explores a vocal drone that would surely make Ozzy smile, before some Purple influenced riffs on the outro. Key to the band’s confident ball busting style is the rock solid rhythm section of bassist Gordon Duncan and drummer Harry Bland, who push the twin-barrel incendiary riffs of guitarists Olie Trethewey and Yonnis Crampton all the way. They might teach you the rudiments of theory, technique and even business at the Brighton Institute Of Modern Music where the band learnt their craft, but they don’t necessarily bless you with an intuitive feel for hard rock, let alone some of the great guitar tones to be found on ‘Free’. The band rips into the track like veterans and Liva leans into the song fearlessly, again hitting the top notes impressively. The single ‘Ain’t Go No’ (spelt ‘Know’ on the album) is similar to the opening ‘Conclusion’ in as much as it finds Liva as the first person narrator dissatisfied with a relationship, on a busy, ambitious rocker that doesn’t quite achieve what aims for, as it searches for a suitable resolution. ‘Sacrifice’ is heavier piece full of dirgy, staccato riffs and extravagant cymbal splashes, as Liva‘s vocal swoop rises above the pervading rumble. It all works effortlessly and the concluding crescendo and perfunctory ending makes light of the fact that this is their debut recording. ‘Common Man’ leans back on the heavier template of ‘Sacrifice’, with a mix of insistent opening sustain and sledgehammer riffs on a track that sounds as if the band have just stumbled on their grand parents 70’s hard rock collection, and added Liva coarse vocals and some burning solos to great effect. This entry was posted in ALBUM REVIEWS, ALBUM REVIEWS (Mobile), All Posts and tagged AC/DC, album, Black Sabbath, Black State Highway, Deep Purple, Gordon Duncan, hard rock, Harry Bland, Led Zeppelin, Liva Steinberga, Oli Trethewey, Ozzy Osbourne, review, Yonnis Crampton. Bookmark the permalink.